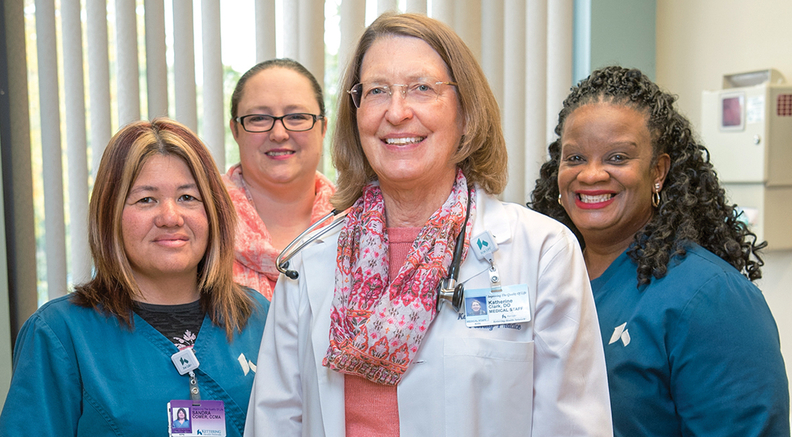 From left: Sandy Comer, CMA – Care Navigator, Julie Clemmer – Practice Coordinator, Katherine Clark, DO, Willene Deavors–Issa, LPN. Story​ was​ updated​ Sept.​ 15,​ 2017. Dr. Katherine Clark was tired of the fee-for-service status quo. Every day, she would go through the same motions: see patients, treat their ailment and not see them again until they had a new health issue. But those patients weren't getting better in the long run, and she wanted the cycle to end. That required a change in how she and other members in her practice were paid. "The way reimbursement has been structured for years was that in order to make ends meet, there was pressure to see patients as rapidly as possible," said Clark, a family medicine doctor who practices at the Integrated Medical Group in Beavercreek, Ohio. The practice is part of the Kettering Physician Network, which has 135 primary-care physicians in 37 practices in the Dayton, Ohio, area. In 2012, Clark and her practice began their journey to transform how practitioners delivered care. When the practice was accepted into the CMS' Comprehensive Primary Care Initiative, it moved from the standard care pattern to one that put more emphasis on preventive screenings and follow-ups. Not only did she notice an overall improvement in quality of care, her practice also achieved notable savings under the model. Clark's practice reduced average monthly patient costs by about 40%, from more than $1,200 a month to $725 by the time the initiative ended in 2016. The practice also had marked reductions in emergency department utilization and hospitalizations for chronic illnesses. And the program helped them decrease costs associated with congestive heart failure by almost 50%. Providers are hopeful that success stories like Clark's will spur the CMS to pursue more multipayer models like the Comprehensive Primary Care Initiative. Introducing more models that only target Medicare beneficiaries, especially now that the agency wants to make participation in value-based pay arrangements voluntary, may not be enough to get doctors out of the fee-for-service mindset, physicians say. "It really doesn't work if there is a single-payer approach, simply because there isn't enough volume of any one payer in a primary-care practice to create the critical mass necessary to transform care," said Dr. Richard Shonk, chief medical officer at the Health Collaborative, a not-for-profit that trained practices to operate under CPC. If the CMS truly wants practices to get away from a care model that focuses more on volume instead of quality of care offered, multipayer models are the best way to move forward, according to Kevin Sears, executive director of Cleveland Clinic's market and network services. "It's much harder to do that when the expectations are fragmented among different payers," Sears said. 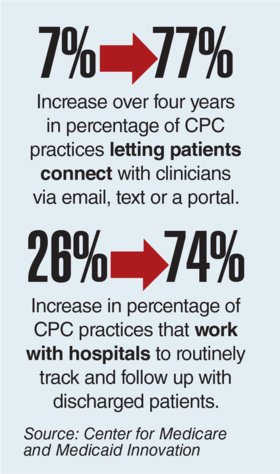 The Comprehensive Primary Care Initiative model is so popular among clinicians that 96% of practices participating in CPC stuck around for the experiment's next phase, known as CPC+, which began Jan. 1, 2017, the CMS announced in a Sept. 7 notice. Unlike most of the CMS' models, CPC had the agency team up with commercial payers and managed-care plans to lower healthcare costs for all patient populations in a particular region. Each payer doled out a monthly fee to practices of around $20 in order to encourage better care coordination by primary-care providers. 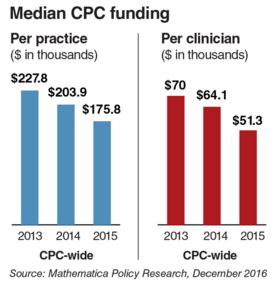 Each practice on average received $175,775 from the CMS and other payers—equaling $51,286 per clinician or 12.5% of practice revenue—for CPC participants by the third year of the experiment in 2015, which is the last year full data are available. By the end of 2015, payers invested over $370 million to transform primary care and 445 practice sites in seven regions participated in the program. In all, about 327,000 Medicare beneficiaries and nearly 3 million patients nationwide saw their care affected by the CPC model. Clark's practice used the payments it received to hire a care coordinator, a health coach to encourage patient engagement and a registered nurse. Patients were also ranked based on their medical needs and received proactive monitoring of patient adherence to care recommendations for their high-cost chronic medical problems. "We were able to use the revenue that came in through the program as seed money to begin to change our whole system's model of primary care," Clark said. Prior to CPC, practices didn't have adequate financial incentives to promote preventive screenings or to make sure patients followed through with their primary-care physician's referrals, according to Pete Atkinson, administrator of SAMA Healthcare, a medical practice in El Dorado, Ark. "In the past, we would make a referral and walk away from it," Atkinson said. CPC payers' dues were crucial to make preventive screenings and referral follow-ups a priority, according to Dr. Matthew Callaway, a family medicine specialist at SAMA. The practice was able to use the funds to expand its staff and create care teams made up of a doctor, nurse and care manager. The payments "gave us a little bit of teeth to track the patient better," Callaway said. CPC also led to increased data-sharing between providers and payers so that clinicians could track high care users and coordinate their needs, Sears said. Having all data in one place, allowed CPC practices to quickly identify gaps in patient care and see when their patients received treatment outside of their practices. They could receive alerts when a patient went to the ER. During the third year of the experiment, the CPC generated a total of $57.7 million gross savings in Medicare expenditures alone, according to the CMS. Savings data from other payers was not available. CMS officials acknowledged they often talk about the need for synergy of requirements between the agency and other payers. The agency tries to adopt quality measures that are in place by private plans, according to Jean Moody-Williams, deputy director of the CMS' Center for Clinical Standards and Quality. Moody-Williams also said the CMS is committed to find ways to continue to partner with other payers as it develops other models. "It is a necessity if indeed we're going to make any progress in transforming care," Williams said during an advisory panel meeting Wednesday.